Our BLG readers have started for the 2012/2013 year! 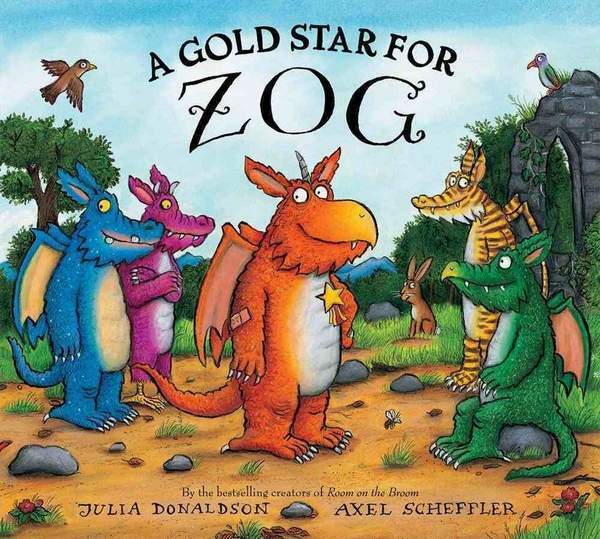 Our first reader was Maria and she brought in the entertaining A Gold Star for Zog written by Julia Donaldson and illustrated by Axel Scheffler. This story is about a dragon named Zog who is determined to win a gold star at Dragon School for mastering the lessons that Madam Dragon teaches. Unfortunately, he is quite accident prone and he wins more bumps and bruises than stars for stellar achievement. Luckily for Zog, a young girl shows up after every injury and tends to him – bandaging, soothing and healing. Students had quite a bit to say as Maria read and recounted all of Zog’s injuries. This story takes place over time and so the reader must pay careful attention to how the illustrator shows the passing of years. Some students missed the text clues “In Year Two. . .” “A year went by and in Year Three. . .” but they saw differences in the pictures. Many of them commented that both dragon and girl were getting older and taller as we moved through the book. When it is revealed that the girl is actually a princess, we were pretty excited! We were all quite excited about how this book ended. Yes, Zog got a gold star but our princess got a starring role in the life she wants to live. This is a fantastic message! This entry was posted in BLG Reads this week and tagged Axel Scheffler, BLG Reads, great read alouds, Julia Donaldson, picture books, rhyming text by carriegelson. Bookmark the permalink.